1,2 &3 BHK ApartmentsStarts From 1.64 Cr. Lodha Bel Air: Your doorway to luxury and comfort of the highest magnitude for a posh lifestyle in Mumbai City! Mumbai is an amazing city where the fun never stops! Being a city of opportunities, modern-day living, mixed cultures, glitz and glamour, Mumbai is a city that many want to be a part of. With the property demand in Mumbai increasing to a great extent, Mumbai’s real estate market is booming with a number of residential and commercial projects throughout the city. If you are looking out for a modern-day living packed with vibrant features and total comfort, look no further! Lodha Bel Air is a new residential project in Mumbai by Lodha Group that is designed by Hafeez Contractor and offers a lavish living experience like no other! Welcome to a new world of flawless luxury that will be loved for generations to come. Extended over 5 acres of land, this residential development contains 6 glorious towers (G +22) that offer 1 BHK, 2BHK and 3BHK luxury apartments of different configurations with beautiful interiors designed byAshiesh Shah, one of the most popular interior designers in Bollywood. The apartment carpet areas start at 380 sq. ft. and go up to an amazing 1289 sq. ft., offering maximum luxury space that you and your family will never run short of! Lodha Bel Air Mumbai is the ultimate destination for luxury and comfort galore! Loaded with world-class internal and external amenities, experience a modern-day lifestyle that will satisfy your senses every day.The apartments are spacious, provide amazing air-flow in every room,natural lighting and contain branded fittings & fixtures, premium flooring, decorative doors, wide balconies and windows providing jaw-dropping views of lush greens, stylish kitchens with high-quality counters and multiple provisions, electrical sockets for multiple electronics located efficiently for convenient access, multiple safety features and the list goes on.The external amenities at this development are crafted for the highest level of comfort and leisure that you and your family will love. This residential development takes you away from the daily hustle & bustle, and lets you unwind and have a great time with your family and friends each day.The external amenities include a hi-tech gymnasium for you to always stay fit, swimming pool to take away the heat, multipurpose hall to celebrate festive occasions, Ganesh temple, café, tree-top walkways that provide a unique experience, picnic areas surrounded by lush greens, hammocks, beautiful sit-outs to spend time with your loved ones, landscape garden, fabulous entrance lobbies and high-end security with video surveillance. 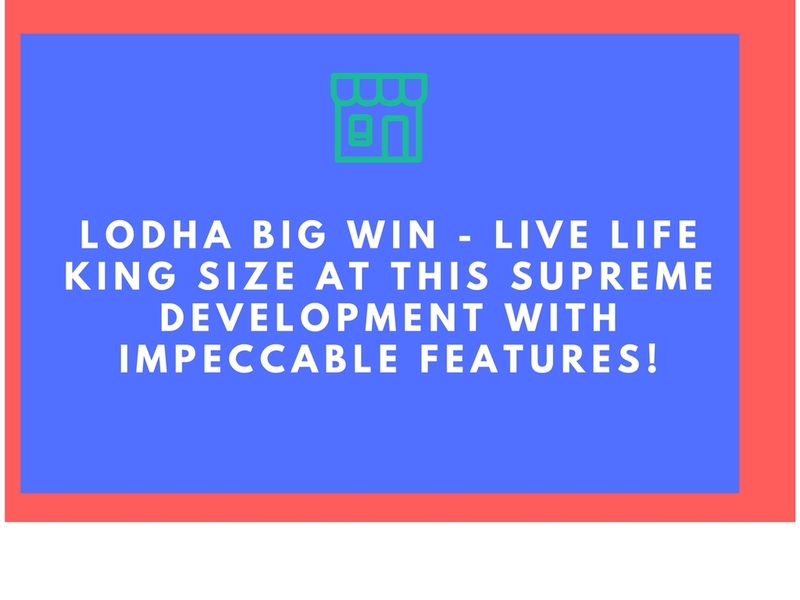 Without a doubt, this development is where you can live life king size! Situated at Jogeshwari, a popular suburb in Mumbai, Lodha Bel Air Jogeshwari has all of your daily and emergency landmarks in close proximity and offers you a life of convenience that will make you feel like a king! From schools and colleges, to medical centres, hospitals, malls, shopping centres, multiplexes, supermarkets/hypermarkets, convenience stores, retail outlets, automobile showrooms, banks, ATMs, petrol pumps, clubs, lounges, resto-bars, restaurants, cafes, highways, public transport and a lot more can be accessed without worrying about long-distance journeys. Everything you need is just a hop, skip and jump away! Starting at a price of Rs.1.64 Cr. and moving up to Rs.3.39 Cr., the Lodha Bel Air price is unbeatable and totally worth the grand features that it has to offer. May it be a new home or an investment for that matter, an apartment at this development is definitely worth a buy. You can choose from several payment plans along with NRI services, home loan facilities through renowned banks, customer support and more. Book your apartment today and turn your dream of owning a luxury home in Mumbai into reality! 5 Acres of Land Parcel 6 Towers of 2level of basement+G+ 22 Storey. Architecture designing by Hafeez Contractor. Landscape – World’s renowned name “ Sitetectonix”. Architect & Interior Designer – Ashiesh Shah. 100,000 sq. ft. of landscape. Grand entrance lobby with finest finishes. Tree top walk – a truly unique experience. Picnic areas with hammocks & outdoor seating. Located at Jogeshwari West, Mumbai. Less than 5 minutes drive : Western Express Highway, S V Road, New Link Road, JVLR. Less than 20 minutes drive : Lokhandwala, Andheri CBD, Airport, Film City. Multiple train connectivity options : Ram Mandir railway station, Metro Line 6 (upcoming). Janki Devi Public School | Oberoi International | Ryan International | S P Jain College | NMIMS. HOSPITALS : Kokilaben Dhirubhai Ambani | Hospital | Criti Care | City Hospital. Nirlon Knowledge Park | BKC | Malad Mindspace | Solitaire Park | NESCO | Film City | Seepz. Infinity Mall | INOX- Inorbit Mall | Oberoi Mall | PVR-City Mall | Star Bazar. Shree Shankheshwar Parshwanath Jain | Derasar, Mahadev Mandir.